Ma added a pinch of salt to some flour. With her fingers she crumbled lard through it, until the particles would pact [sic] together when pinched. Then she added a little cold water as she mixed it in lightly to make a dough. Now she rolled the dough out thin and lined a pie-tin with it. 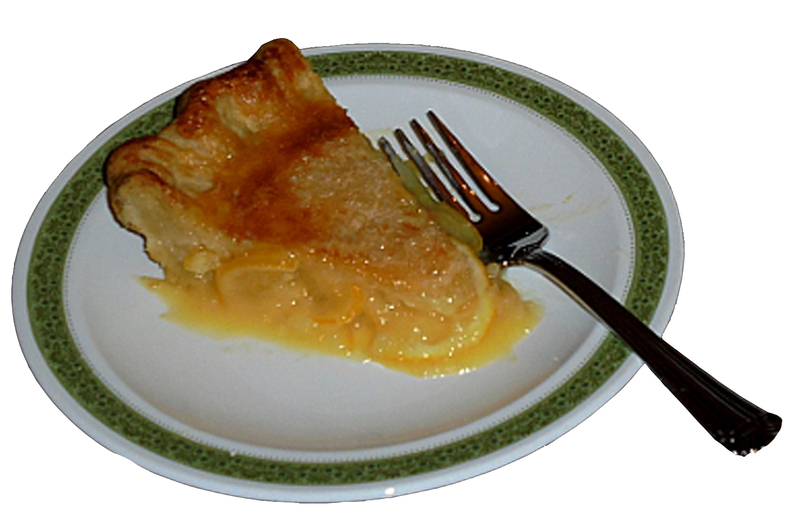 She cut the lemons into very thin slices and laid them on the crust until the pie-tin was nearly filled. Then she covered them with sugar – Oh lots and lots of sugar. Over this she placed the top crust, with its small pine-tree cut in the center, and she baked the pie until the flakey crust was a delicate light brown. The lemon pies I always knew had a smooth filling topped with meringue, so when I first discovered the above passage, I was fascinated. Could one really make a pie that way? Turns out, it’s a popular way to make them! The recipe was originally created by the Shakers, who considered lemons important to their diet. They believed it was a sin to be wasteful; thus they used the entire lemon. An authentic Shaker lemon pie (also called Ohio lemon pie, as the Shakers who developed the pie were from that state) would use only true lemons, white sugar, and eggs in a double crust. Today, Meyer lemons are most often used. This lemon-orange hybrid is not only sweeter than a true lemon, but it also has a thinner skin. Other changes have crept into modern recipes, too. Some people add vanilla or spices; others thicken and smooth the filling with a little butter and flour. Some even cream the ingredients (including lemons) together in a blender. What everyone agrees on is that the lemons must be sliced as thinly as possible, and left to macerate in the sugar as long as possible – at least a couple of hours and up to overnight. Wash lemons and slice them thin as paper, rind and all. Combine with sugar; mix well. Let stand at least 2 hours, stirring occasionally. Stir in beaten eggs and mix well. Turn into 9” pie pan lined with one crust, spreading lemon slices evenly. Cover with top crust; pinch closed around edge; slit to vent. Bake at 450 for 15 minutes, then reduce heat to 375 and bake another 20 minutes, or until knife comes out clean. Cool before slicing. For a more modern taste, you might try adding 1 teaspoon vanilla, 4 tablespoons melted butter, and 3 tablespoons all-purpose flour with the eggs. You could also bake without a top crust, or with a lattice top. Have you ever had a Shaker lemon pie? Did you enjoy it? And what would a lime pie – or an orange pie – made this way (but with adjusted sugar amounts) taste like? Thought I’d share a few photos of our recent trip to DC. 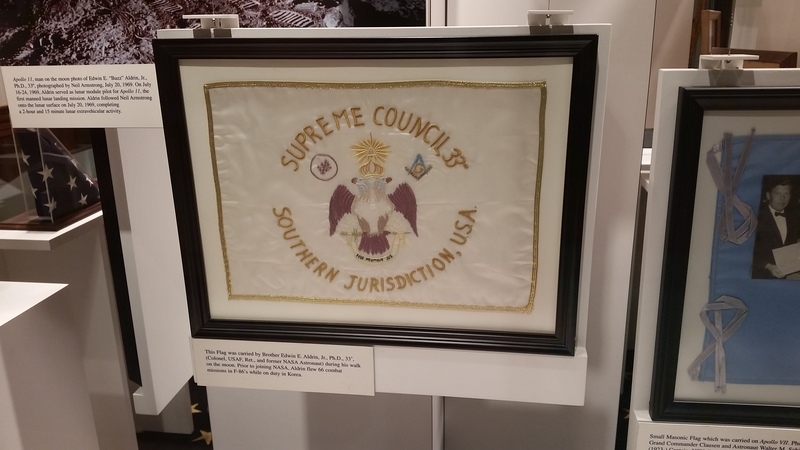 I was invited to give a presentation at a conference on fraternalism, so we took the opportunity to see a few things we didn’t get to the last time we were there. Belmont House: This historic was built c. 1911 by Perry Belmont as a place to bring his wife. She had been previously married to a homebody, who made the mistake of letting her attend social events with their single friend Perry. When she divorced her husband and married Perry only five hours later, the new couple was ostracized in their hometown of New York City. So Perry moved them to DC and built this house. However, news of their history found them, and when they threw their first large ball, only one couple attended. Luckily for them, the couple was President and Mrs. Taft; after that, they were suddenly back “in” society. This is not an umbrella stand but a cane safe. Back in the day, society men’s canes were adorned with lots of gold and other precious metals, so these lockable holders kept them safe at large gatherings. This is a closer view. Snazzy, isn’t it? Now see the books on top? The second one is mine (Little Lodges)! 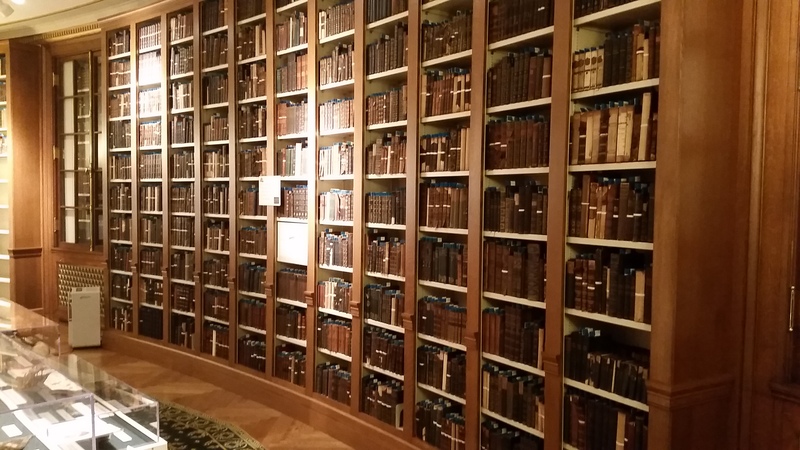 No one knew I was coming for a tour, and the guide didn’t know me, so it wasn’t “planted.” Hubby asked, and the guide said those are the books always kept on the desk. The grand ballroom. Notice the mirror over the fireplace on the right. When this mirror was installed, it was the largest single-piece mirror in the world. 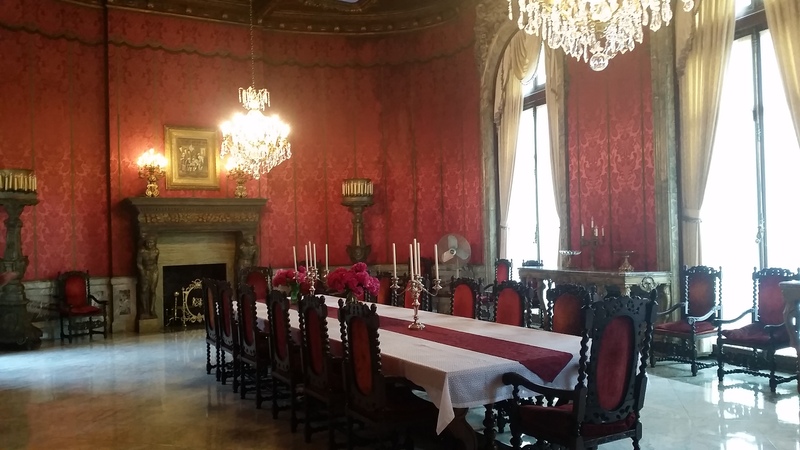 The formal dining hall. 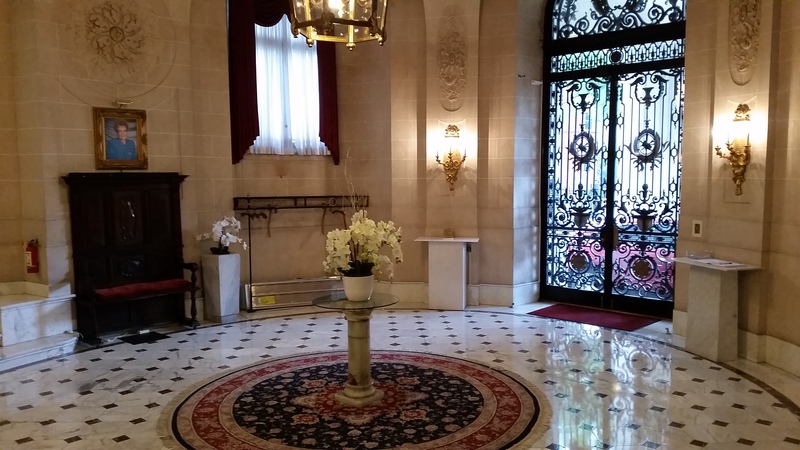 I love the old candelabras in front of the far wall. 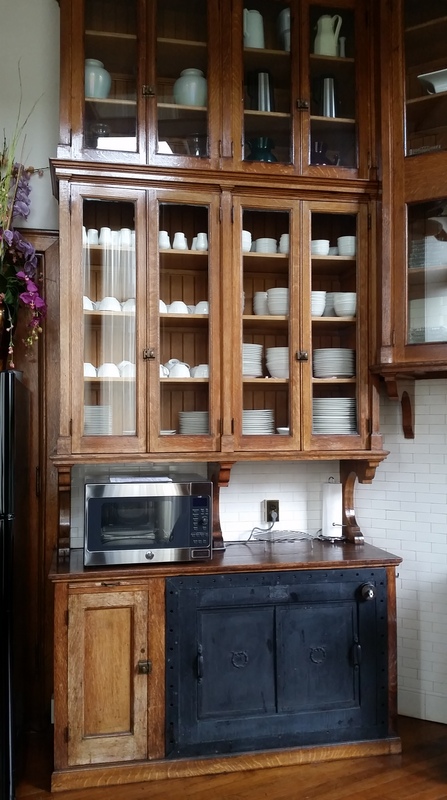 The microwave is modern, obviously, but the cabinetry and warming oven in the kitchen are original. You need a ladder to reach the top cabinets. The House of the (Scottish Rite) Temple: Built in 1915, this building houses an old research library and museums in addition to meeting rooms. One of the meeting rooms. 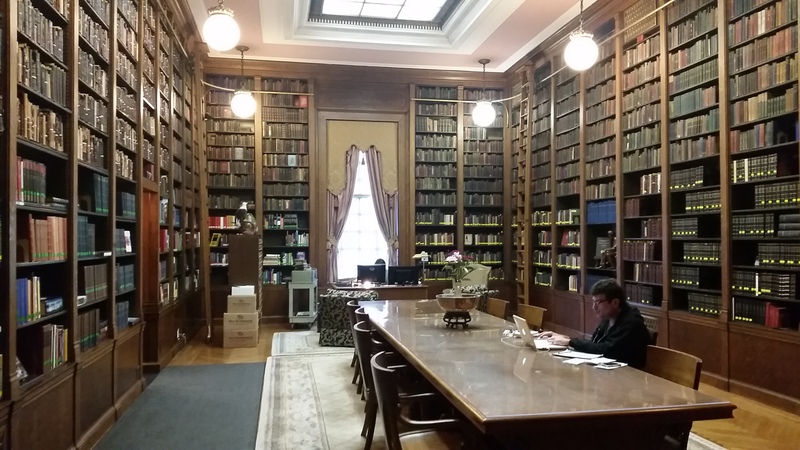 One of the research libraries. I wrote about this in Little Lodges! Another library, because you can never have too many books. 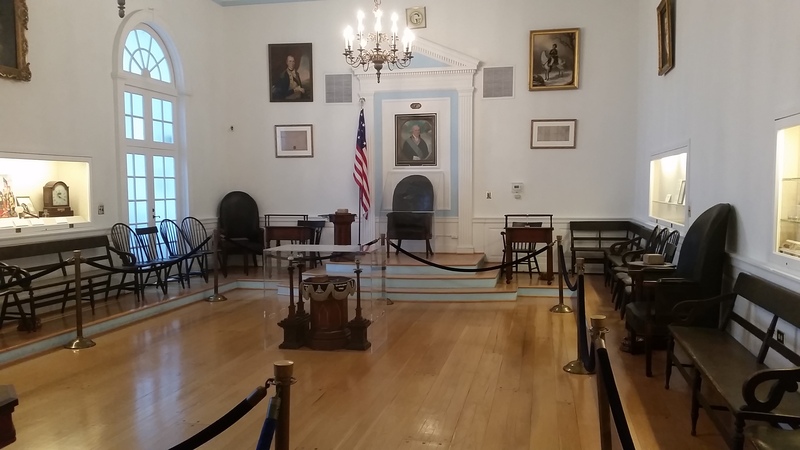 Replica of the lodge meeting room in which GW met. 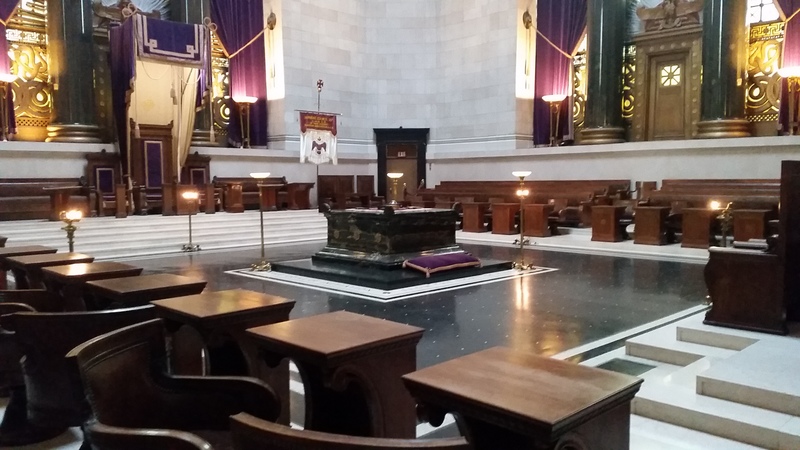 The altar (in center), bible on it, and Master’s chair (under portrait far wall) are all original from that lodge. Other artifacts from GW’s life are preserved in the wall cubbies, like the clock from Mt. Vernon seen to the left. The grounds as seen from the top floor observation deck. And finally, a pretty terrible shot of me beginning my presentation – hubby took it with a zoomed in cell, in a room with dimmed lights (for the slides), which is always a disaster. I caught a cold the day before the conference began and presented this paper with a wicked sore throat. Must have done okay, though, because two academic presses asked to publish it, and a third organization asked about hosting me in a few months. But my next gig is in July, at the Story Circle conference. I’ll be leading a workshop on how to turn your passion into a book. Come join us! Eliza Jane was more bossy than ever. She said Almanzo’s boots made too much noise. She even told Mother that she was mortified because Father drank tea from his saucer. “My land! how else would he cool it?” Mother asked. Mother actually stopped working. She took her hands out of the dishpan and turned round to face Eliza Jane. Eliza Jane opened her mouth, and shut it, and looked foolish. That shut up Eliza Jane. This was the first, and for a long time, only, reference to drinking from a saucer that I’ve ever come across. Mother Wilder’s history was a bit faulty: Europeans first explored China in the 1516, when the Portuguese explorer (and cousin of Columbus) Rafael Perestrello landed on the southern coast of mainland China and traded in Guangzhou. I think what Mother Wilder had in mind was the United East Indian Company, a Dutch-chartered trading company that had a trade monopoly with China in the 1600s. “What do you mean by ‘at work in the world’?” said the master, pausing, with his lips close to his saucerful of tea, and peering at Tom over it. “Well, I mean real work; one’s profession; whatever one will have really to do, and make one’s living by. I want to be doing some real good, feeling that I am not only at play in the world,” answered Tom, rather puzzled to find out himself what he really did mean. Cups and saucers have been used since the Middle Ages, and I could find no definitive answer about whether they drank from the saucer as well as the cup, or when that habit began. But it certainly was common in Russia and Scandinavia for many years. In fact, in Sweden, they not only sipped from the saucer after purposely overfilling the cup, but sipped the beverage through a lump of sugar held in the front teeth, a custom called “dricka på bit” or “drink with a lump.” While there are people who remember their elderly, usually rural, ancestors drinking this way, it seems to have fallen out of favor in the 20th century. It was still a common enough practice in 1914 to be portrayed in a painting by Konstantin Makovsky. Drinking from the saucer was not confined to Europe. There is a story that when Thomas Jefferson returned from France to find Congress organized into two parts, he asked George Washington why there needed to be a Senate. Washington answered with another question: “Why do you pour tea into your saucer?” Jefferson answered, “To cool it.” “Just so,” responded Washington, “we pour legislation into the senatorial saucer to cool it.” See, the Federal Convention felt that the members of the House were too emotional, so the Senate was formed to have “cooler heads” prevail. This story is anecdotal, but does show that using the saucer to cool the tea was a familiar custom here in America. Life has been rolling along—much the same as usual, so I’ll spare you all the details, and just mention a highlight: our trip to Missouri last month. First we went to visit our good friends, Arnold and Nancy. They are a wonderful couple so of course we had a wonderful time. In addition to deciding how to fix the world (if we could only get everyone to do what we say! ), we discussed books and movies and other fun topics. We also went fishing; I caught my first-ever trout. I took a day to go to nearby Hermann for some genealogical research, and found quite a bit of information, including this picture of my great-great-grandfather, Joseph Crider, Sr. I can’t see any resemblance. Book-related, we agreed upon a collaboration to publish a non-fiction related to aquaculture in the coming months. My co-author has completed most of the research (including with long-term experience), and we’ve already begun the writing process. I’ll keep you updated. In addition, if things go as planned, I’ll have another LIW-related work out by Midsummer Day. That’s my self-imposed deadline; we’ll see if I meet it. It’s been a secret, but now that it’s coming together, I’m letting the cat out of the bag. What’s it about? Watch for the announcement on this blog, or on my Facebook or twitter pages or Henscratches website. Back to the trip. After a week, we made our way to Springfield/Mansfield, where I met up with some Laura Ingalls Wilder friends. The museum had a ribbon cutting, which was our excuse to go, and it’s always a treat to visit a LIW site, especially with friends. I purchased William Anderson’s latest, The Selected Letters of Laura Ingalls Wilder. Most people will find quite a bit of “new” information about Laura. Having done so much research for Little Lodges on the Prairie, I was familiar with most of it, but it was still nice to be reminded of LIW’s real life story. You can learn quite a bit about a person from their letters, can’t you? If you enjoy Little House (or ever did), you should seriously consider purchasing this book. Afterward, we met at Lambert’s for food and laughs. Love these ladies! Hubby and I are back home now. I’ll spend the day tomorrow (Mother’s Day) with my girl. On the agenda: games, books, movies, cooking, yoga, coloring, and a walk in the park. I’m sure we won’t get to all of it, but we’ll have a relaxing day just doing whatever we want to. Monday, it’ll be back to the usual routine, including working on the 3 books. I do best when I can switch between projects; prevents brain fag. Good thing I have several more in the pipeline! Click image to see more information.